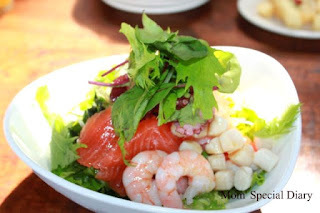 Mom's Diary: Food Trip Friday- Sashimi salad, Lobster and Hamburger steak. Food Trip Friday- Sashimi salad, Lobster and Hamburger steak. Hello food trippers how's your day going ? Hope everyone is doing great today! By the way folks its TGIF and welcome to Food Trip Friday here's my FTF post for today..
nicely plated... looks yummy too. 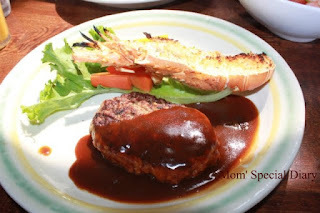 I am not into raw meat, so I would go for the Lobster and Hamburger Steak, but I agree with Vernz.. foods were nicely plated. My FTF entry is now posted, too! I'm with Jenn, I'm a confessed Shrimp lover but I think eating it raw is where I draw the line. I'll take the surf & turf though! Mmmmmlooks yummy. I miss eating sushi and sashimi. Oh well a few weeks more!